I WANT TO FLY tells the story of a peasant woman who accidentally discovers she has the ability to be a witch. At first, she refuses to admit it. Then, the circumstances of life take her to want to be a witch. She performs the ritual to fly. Since then, her life changed. The book narrates the events experienced by this woman to become witch, and what she makes later. Witchcraft becomes for women a medium to access knowledge. 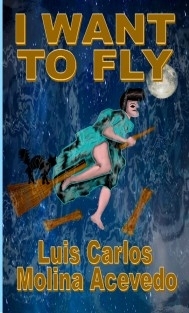 The flight on broom, allows them to broaden their horizons and meet new people and new places. Witchcraft opens the door of knowledge for women in that time and geography. Come fly with this story that escaped the haunch of a broom.